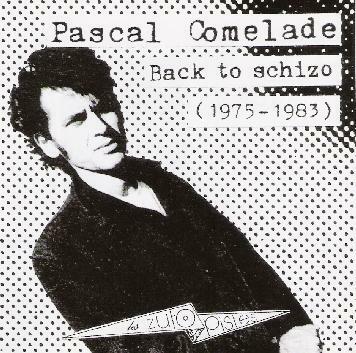 Pascal Comelade - "Back to Schizo: 1975-1983"
I've never heard of Pascal Comelade but the promo sheet refers to his discovery by the public in the mid-80's. I'm not sure what that milestone was but I do know that he was quite busy going back to 1975, having released 4 LP's, numerous cassettes and contributions to compilations, as well as concerts mostly in his native France but elsewhere in Europe as well. Back to Schizo is a compilation of tracks from these early releases hand picked by Comelade himself. The CD opens with a nearly 5 minute selection from Comelade's first album, Fluence (1975), which consists of the duo of Comelade on piano & organ and Richard Pinhas on guitar. It features repetitive patterns that straddle the line between minimalist and soundscape, being very much along the lines of the kinds of experimentations Fripp & Eno and of course Heldon were immersed in at the time. The next 6 tracks (9 minutes) are from Comelade's 1978 Sequences EP. The music is similar to Fluence, but is comprised of synthesizers and a toy piano sounding instrument called the Synthi AKS/EMS. The result is 6 short musical experimentations that are really just fragments of what clearly has potential but really needs more time for the ideas to be fleshed out. The next 10 tracks (about 12 minutes) are from Comelade's second album, Paralelo (1980). Right away I sensed that Comelade was exploring considerably more interesting electronic territory. The music is at times aggressive and intense, spacey and floating, with a herky jerky sense of "near" rhythms, but also gets downright dancey at times, being a sort of spaced out precursor to techno. It has repetitive patterns, but they develop enough to keep things interesting. It's raw stuff to be sure, though everything on this album must be considered within the context of the experimentations of the 70's and early 80's. 26 tracks in only 41 minutes results in must what you would expect… a collection of brief musical thoughts. However, given the times it's interesting to hear an example of what a lesser known artist was experimenting with during this pioneering era.